A ball of aluminum foil bounced off the back of Seth's head, and an even deeper flush crept over his cheeks. Before I could stop myself, I spun around to see two first-years snickering with their uniform ties looped around their heads. "Hey, Lame and Lamer!" They froze and stared at me, not quite sure how to react. "Just thought I'd let you know that you've managed to piss off the most powerful guy at Pemberly Brown." Yay for Liar Society love!! I'm so excited that the world can now officially love Kate as much as I do! So many Teaser's and TBR's! I don't think I will ever catch up :) Thanks for posting, it sounds like it's a very cute and fun book. Not sure where on the list to put it but it is going on there! I can't believe their release day is finally here. So exciting. And I can't wait to read it. 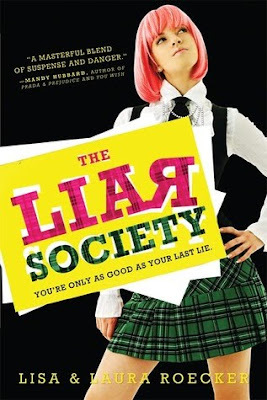 I want to read The Liar Society! "She starts to enter the lab and then turns abruptly and walks back to me, her face wild and unfamiliar-looking, grabbin me with both shoulders, putting her mouth directly to my ear. I'm so startled I drop my clipboard. 'You know you can't be happy unless you're unhappy sometimes, right?' she whispers, and her voice is hoarse, as though she's just been crying." this is such a GREAT idea! hope i remember to do this next week! ohhh i must check out this book. Hahahaha! Sounds like a fun one. And why is it that when I read "first years" I am automatically thinking of Harry! Sheesh.